Excellencies, ladies and gentlemen – good afternoon. 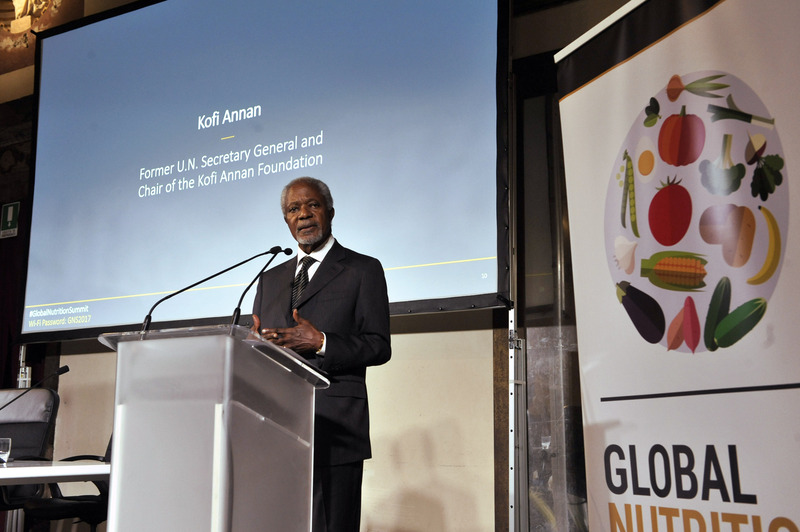 I am delighted to be here with you all in support of greater progress for nutrition. Along with many of you here today – a little over four years ago – I attended the first Nutrition for Growth Summit in London. At the time, it felt like a historic moment for nutrition. In the past, malnutrition was largely invisible. It was not a high priority nor was it clearly understood. Yet, there in London in 2013, leaders from all over the world had gathered to commit to more and better nutrition. And as you know, the meeting resulted in over 200 commitments. These included pledges from countries and businesses, civil society and private foundations, adding up to an unprecedented $4.15 billion financial commitment. And a lot has happened since then. The World Health Assembly global nutrition targets were enshrined in the Sustainable Development Goals, further strengthening the case that nutrition underpins most – if not all – of our health and development priorities. And in Africa, leaders are also addressing nutrition as not just a health issue, but one that cuts across multiple sectors and issues too. In 2014, the African Union adopted the Malabo Declaration, committing to ending hunger and reducing stunting to 10% by 2025. And last year, at the Annual Meeting of the African Development Bank, I had the honor of attending the launch of the African Leaders for Nutrition – an initiative led by current and former heads of state to elevate nutrition as both an input and output of development. Thanks to the commitment of partners here today, we have made sustained progress since the first Nutrition for Growth Summit. Yet, we all know that we’re gathering in Milan because malnutrition continues to threaten children’s bodies and brains; a women’s ability to have a healthy pregnancy and baby; and, for many countries, their economic growth and development. As we heard earlier, nearly every country in the world is facing a malnutrition crisis. But what has also transpired since 2013 is that we have a clearer roadmap – we know which interventions we need to prioritize and how much they cost. Commitments made at the Nutrition for Growth Summit in 2013 are starting to generate action, as we’ll soon hear. In many ways, today is a culmination of all the remarkable work that has taken place behind the scenes, as well as on stages like this one. As a global community we are more confident now than ever that ending malnutrition is possible. I believe this to be true, and I believe that we can not only achieve the global nutrition targets; we can surpass them, yet we have to move much quicker and accelerate progress. Today is yet another historic moment for nutrition. We all have an extraordinary opportunity to reduce poverty and inequality by boosting investments in nutrition. What we need now is to sustain the energy and momentum in this room so we can fully deliver on our commitments and pledges, and unlock the economic and human potential of every nation.